If I have been going on the trend of milk chocolate and a bit of white chocolate for the lighter days of summer, then the light dark chocolate (at 63% cocoa content) of Madecasse's Honey Crystal bar should be a perfect transition into the end of summer. Now, it might seem that I've come to yet another in the series of toffee/caramel/honeycomb/sugar crystal chocolates. However, this one is distinct in three ways. First, there is no salt like many of the other bars had. Second, these crystals are smaller. And third, their flavor is of sugar and not at all of caramel. They are composed, by the way, of honey and sugar. The chocolate that carries these honey crystals looks and smells like dark chocolate, not at all milky or watered down. After all, it is 63% and not 54%, so it isn't super low on the cocoa content, even if it is on the lower side. Looking very closely at the surface, you can see tiny light dots underneath where all of the honey crystals reside. When the chocolate first touches the mouth, the warm flavor of the cane sugar comes in. Then the reddish tones of the chocolate begin to make themselves known; it's mild dark chocolate, pleasing in its richness while also never becoming bitter or too deep. I recommend a combination of chewing and allowing the chocolate to melt. 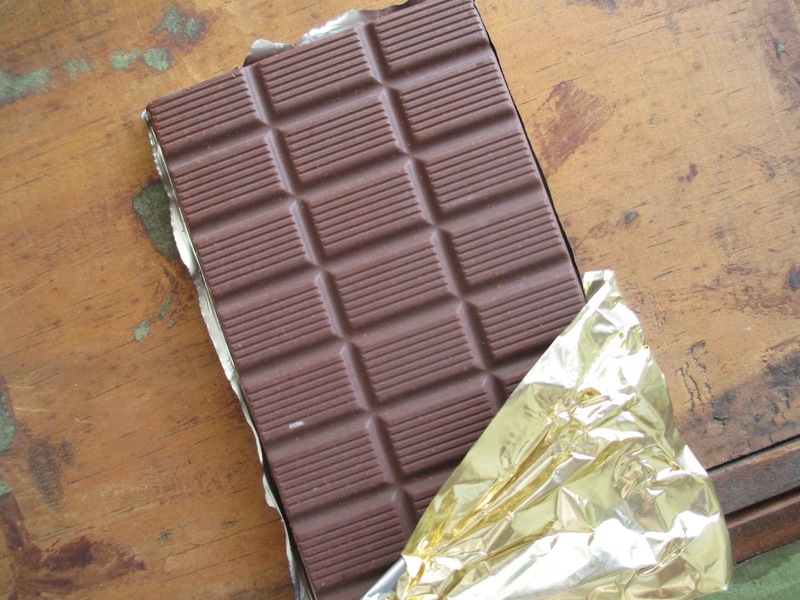 A little chewing is of course necessary given the crunch of the honey crystals, but too much chewing will mask the flavors of the chocolate and thereby take away half the flavor profile. These honey crystals, as I mentioned earlier, are small. For reference, I'd put them at about the same size as coffee grounds. So their crunch is light and rather springy. The effect of this texture almost makes the chocolate feel like it's a rougher grind, like Taza chocolate, even though technically you can tell that this is not that type of chocolate because it still melts normally in between all the little crystals. Still, it's an interesting and unexpected effect. All the labeling states that this is a honey chocolate, from the name of the bar to the yellow color on the card box. I don't, however, taste honey specifically; I taste sugar. I'm not complaining, though: it is a similar flavor to honey. And when I say sugar, I mean the richer flavor of less refined sugar--even if Madecasse uses regular white sugar, the flavor comes across well. This is sweet in a good context. Basically, it's dark chocolate with sugar mixed in as a separate element. You have the fuller flavor of dark chocolate but also with the sweetness and the flavor of sugar. I would call this a mildly flavored chocolate: it's technically flavored but not so much as a mint chocolate or an almond chocolate. This chocolate is in between milk and dark, in between snacking chocolate and evening chocolate. Or, as I hoped, exactly the type of chocolate to use to transition into the end of summer.